We are a "school family", and without YOU we are just a school. Please join us as we celebrate the traditions of our faith and the accomplishments of our students. If you are interested in volunteering as a coach, in a classroom, as a chaperone, mentor, or guest, we welcome you. First, contact the school office or your child's teacher to learn how you can support us. Next, complete the necessary training and documentation necessary. 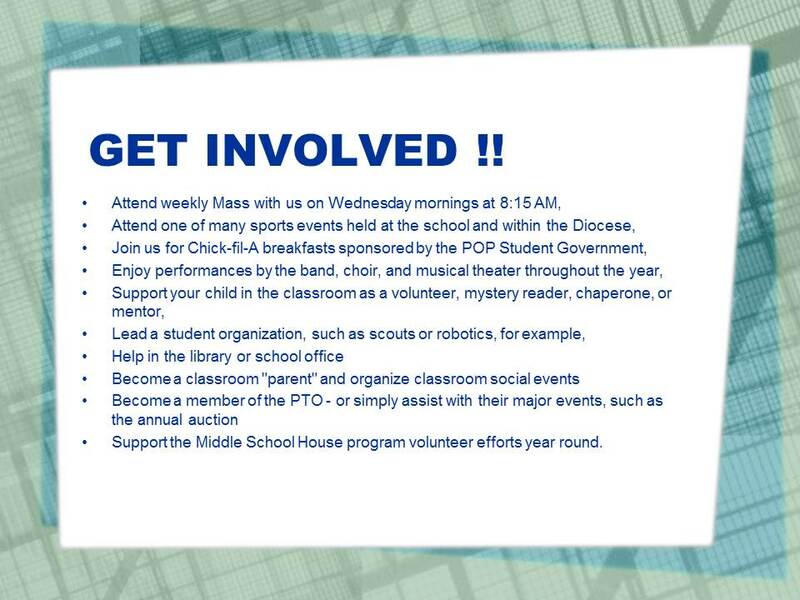 We appreciate your participation at POP, as a visitor of the many activities and events we host. We encourage you to volunteer your time and talents on a regular basis. All volunteers, including family members of students, are required to complete the Youth Protection Training provided by the Diocese of Birmingham. For your convenience, you can choose to attend an upcoming group session, or complete the on-line course. Visit the Youth Protection Link for details.